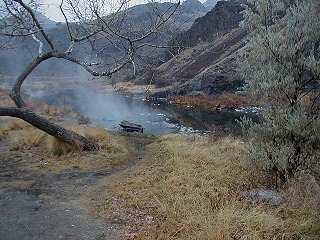 Just inside the canyon near the north end of Lake Owyhee you'll find the Snively Hot Springs Recreation site. 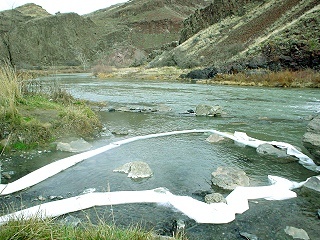 This BLM day use only site typically features 1 or 2 pools that submerge during spring runoff. Their condition depends upon how they are rebuilt after runoff. I have seen a wide variety of pool types; some with designs much more successful than others. 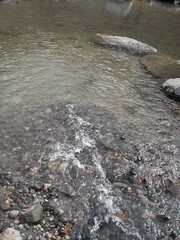 Accessible all year but the pool submerges during spring runoff (large Trout in season). The entire Snively BLM Recreation Site is closed from sunset to sunrise - and yes, it is enforced. There is camping available in the nearby Lake Owyhee State Park and a handful of primitive sites just off the main road semi-near Snively. It's always a good trip when there's hardly any trash to pick up. This place has sure undergone positive change over the years. This visit, the best soak was the only soak - a giant soaker which was a trick to find a suitable soaking temperature in. Hot and cold swirled all around, oftentimes the blasts of hot and cold were too much. All in all, a moderate soak. I'm looking forward to next years pool design, as spring runoff will surely destroy the current setup. 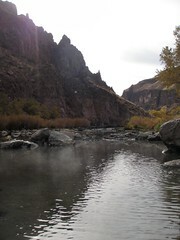 After navigating the maze of not-quite grid roads near Parma and Adel I was able to locate Owyhee Canyon road. I once again found myself entering the high desert canyon after a 2 year absence. The lack of snow, abundance of birds and occasional splash of green grass were a quiet reminder of the high desert prelude to spring. 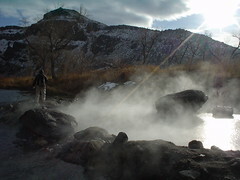 The cold air temperature revealed the steam from the often elusive Deer Butte Hot Springs from the road. 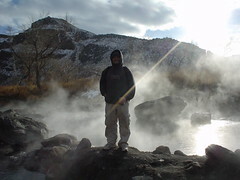 A quick check affirmed my suspicion; despite the existence of water hot enough for soaking, this hot springs still lacks the proper flow required for a healthy soak. That would explain why the remnants were of a concrete pool that would only support a solo soak. A few minutes later, the pullout for Snively was in sight. Nighttime closure? Unfortunately, yes, it is still posted. No overnight camping, no fires. You can, however, camp either up or down the road. Plus, the recreation site for Snively has a pit toilet.... deluxe accommodations indeed for a hot springs in the semi-remote high desert of eastern Oregon. 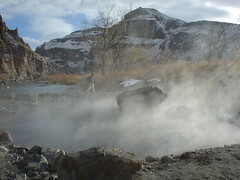 In 1998 the BLM finally decided to close the Snively Hot Spring Recreational Site from sundown to sunrise. The nighttime closure was actually due to assaults, physical fights, minors consuming alcohol and drug usage... not because of the trashed grounds, according to a BLM document I was able to review online. A friend of IDHS (ARGUS) informed me that a couple years ago there was a particular fight that resulted in the Malhuer County Sheriff Dept. patrolling this area on a regular basis. Apparently a group of 4 or 5 people fought with and killed an individual at or near Snively. This was my 4th visit to Snively since December of 2002, and I have yet to encounter any form of disorderly conduct at the recreation site or hot springs. There is something I have run into every visit here, TRASH. Tons of it. 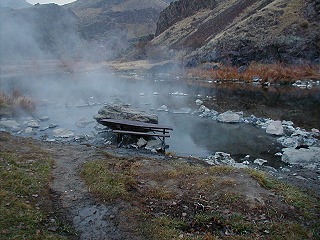 The levels have gone down over the years, but this is sadly still one of the most trashed hot springs I've come across. What goes on here anyway? The only people I have witnessed are fishermen, bird hunters and families. My experience leads me to reasoning that expose all 3 groups as culprits. The source of Snively registered 137° on my digital thermometer. 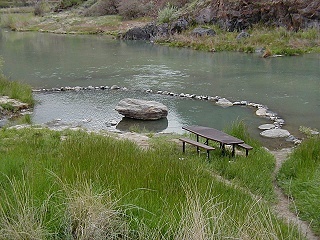 The river pool closest to the bank at 119°, the adjacent pool between 107° - 110° and the smallest pool at 103°. I've seen the pool formation change with each visit and this time was no exception. This time, the pools were deep; 3-4 feet in some places. And - hot!! The rock wall developers did a great job. I would have preferred temperatures a tad cooler, but the freezing 30 mph wind did a good job of tempering the exceptionally hot water. To be honest, I didn't even plan on soaking. I was going to check out the hot springs while hiking in the area, but quickly decided it was just too good of a pool to not soak in. 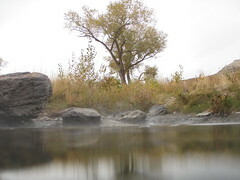 Once in the pool, I expected the hot water to churn with the cold river water to provide continual blasts of hot and cold. Thankfully, this was not the case because the pool depth kept the water a consistent temperature. Thus, an excellent soak was had. Soon, Spring will bring more visitors back into the canyon along with lush colors and spring runoff, which submerges the pools at Snively. I witnessed only one other vehicle in the area the entire day, a truck pulling 2 ORVs coming from the direction of Lake Owyhee. One of the first things I noticed upon arrival at the site marked clearly by the BLM sign as "Snively Hot Springs Recreation Area" was that trash levels were down from my last visit. That's always a great start to a soak. Despite all of the anglers and duck hunters in the area I was able to get reacquainted with Snively all by myself. The pool has been re-designed; the rock walls have been replaced by a plastic tube tarp that forms the wall of the pool. 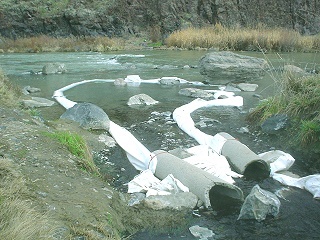 The tube is fed with hot water from the source outflow - forming a barrier of heat against the cold river water while still allowing for the majority of the outflow to continuously feed the pool. It's really a great design idea, however, the only problem is that the plastic tube is torn pretty bad in some places. The good news is that Snively is a great soak for about 2 to 4 people. The plastic tube wall is intact on the side of the pool where the hot source water flows in; creating a nice hot, but shallow soak. While out tracking down other rumored hot springs in the area we just had to visit good ol Snively. I was disappointed the last time (see 12.09.02 trip Briefing below) I was here, however, the situation has improved. Yay! I love it when that happens! Although there was some trash around and the pool was too cool due to spring runoff, the level of trash had decreased severely. I was awestruck by the garbage last time, this time there was little to even notice... even though 1 unit of any kind of trash is still way too much. Needless to say it was a quick clean-up. I was also surprised at the amount of visitors I noticed throughout the day even though no one took a soak... lots of fishing going on this time of year. A friend of IHS (ARGUS) has recently informed me that a couple years ago there was a particular fight that resulted in the Malhuer County Sheriff Dept. patrolling this area on a regular basis. Apparently a group of 4 or 5 people fought with and killed an individual at or near Snively. 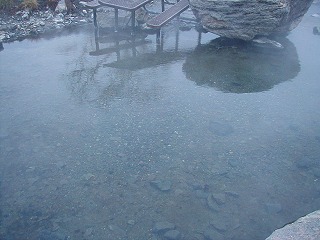 Snively is another hot spring that has fallen prey to misuse, overuse and severe abuse. 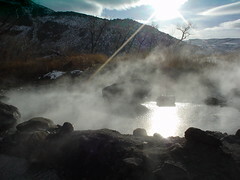 In 1998 the BLM finally decided to close the Snively Hot Spring Recreational Site from sundown to sunrise. The nighttime closure was actually due to assaults, physical fights, minors consuming alcohol and drug usage... not because of the trashed grounds, according to a BLM document I was able to review online. You'll find Snively on the way to Oregon's Lake Owyhee State Park and the cool Owyhee Dam. Once you enter the canyon you are in for some scenic treats which unfortunately deteriorate as you reach the Snively HS Recreational Site. There's literally garbage everywhere once you step out of your vehicle. It's so sad... this place needs to be closed completely so that it might somehow recover from the years of abuse if possible. 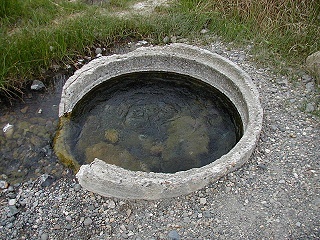 The only pool for soaking is quite large (shallow) and is fed by a hot ditch which in-turn is fed by a standpipe. 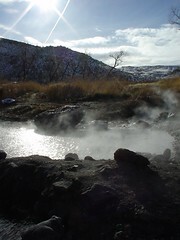 It should be noted that shortly before Snively there is in fact another hot spring! There is no soaking pool, but there could be potential.